How do you create cartograms using GIS? GIS typically focuses on drawing spatial features with accuracy. However, the cartogram does the opposite! Cartogram types of maps distort reality to convey information. They resize and exaggerate any variable on an attribute value. Previously, we crafted beautiful flow maps which show the movement of anything. This time, let’s design all the different styles of cartograms. Density-equalizing (contiguous) cartograms are your traditional cartograms. In density-equalizing cartograms, map features bulge out a specific variable. Even though it distorts each feature, it remains connected during its creation. For example, this density-equalizing cartogram exaggerates the population for area. In QGIS, you can use the QGIS Cartogram Plugin for this style of cartogram. As you can see, it’s easy to get information at only a glance. Which states stick out like a sore thumb in this population map? Instantly, you can see that a high proportion of population live in California and New York. While states like Montana and North Dakota are dwarfed to bite-size proportions. As objects shrink and grow in density-equalizing cartograms, cartographers have to consider resizing polygons appropriately while maintaining their true geometry. 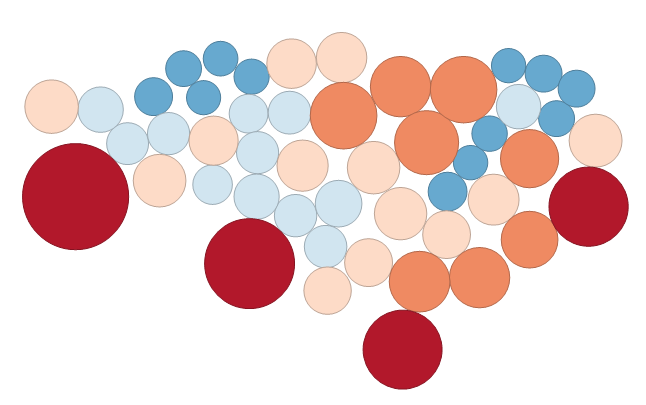 Features in non-contiguous cartograms don’t have to stay connected. Objects can freely move from adjacent polygons and be resized appropriately. Because of this free movement, shape remains in tact for non-contiguous cartograms. For example, this map of the United States exaggerates population. Again, it distorts the geometry and features in the map to convey information about population. For example, the state of California has grown significantly because of their large population. The main difference between density-equalizing cartograms is that it moves each feature’s centroid to avoid overlaps. Although overlaps sometimes exist in non-contiguous cartograms, they can be more difficult to differentiate between resized polygons. The Dorling Cartogram (named after professor Danny Dorling) uses shapes like circles and rectangles to depict area. These types of cartograms make it easy to recognize patterns. In the example below, we used GeoDa software to generate the Dorling cartogram. 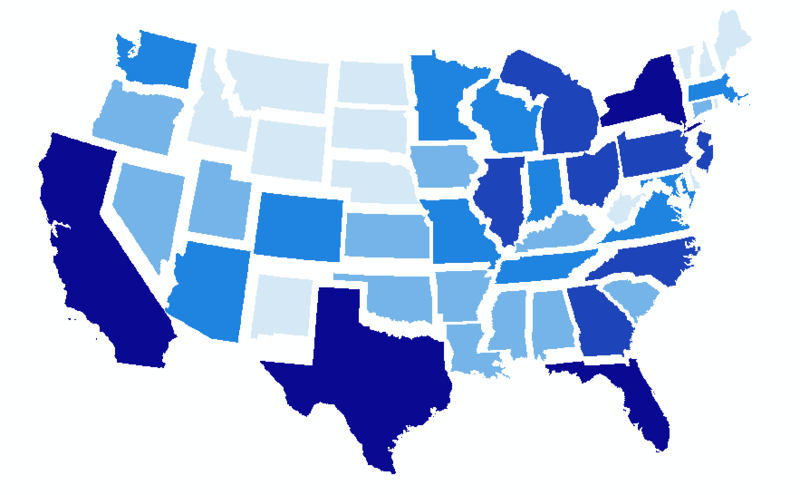 As you can see, states are substituted with appropriately sized circles to represent clusters of population in the United States. Without a doubt, it is highly effective at conveying information and patterns. However, the downfall for Dorling Cartograms is that it doesn’t maintain the centroid and shape. This means that readers may have difficulty understanding features in the map. You may not have even known this was the United States if I didn’t tell you! Do you want to create a cartogram? Cartograms exaggerate the size of the geography proportional to the statistic being shown. Specifically, the variable substitutes land area or distance. But what they do is really distort our view of mapping by breaking the golden rule – sacrificing geometry to convey information. Another key point is each type of cartogram has its pros and cons to effectively visualize data with the variable determining the size of the polygon. To begin creating your own cartograms, give QGIS, GeoDa and ArcGIS a test-drive. 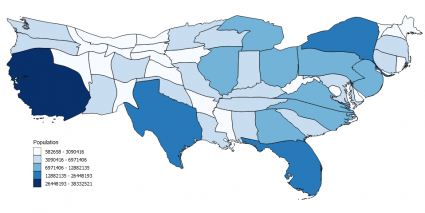 Alternatively, read more on choropleth map as another method of data visualization.